Timings: First 30 moves in 75 mins. 30 mins to completion. 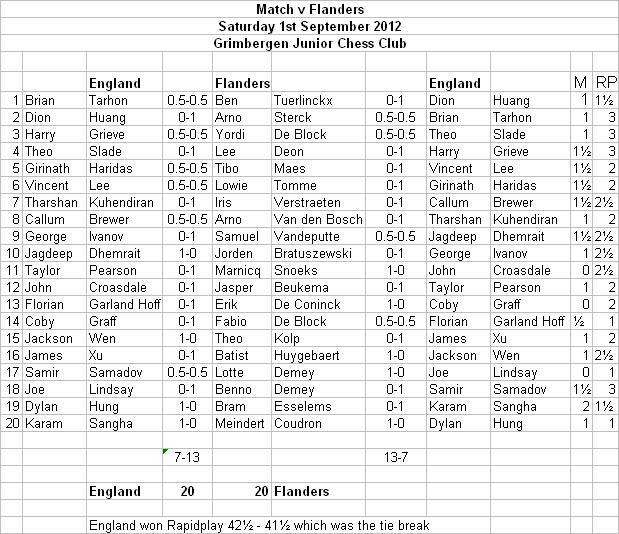 Controller: Mr Peter Purland	Timings: First 30 moves in 75 mins. 30 mins to completion. 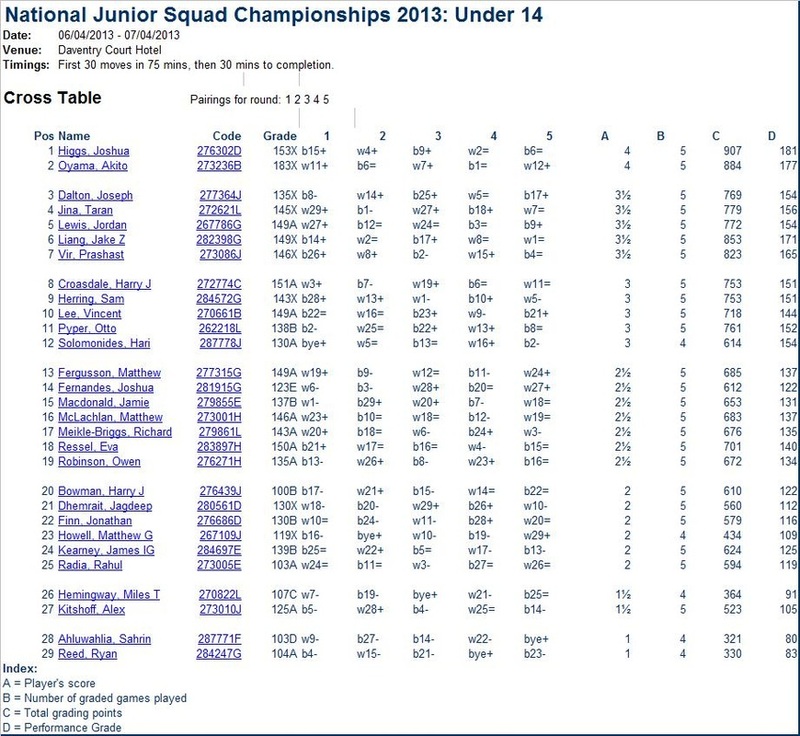 U14s on Tournament Director results website! We returned to the Daventry Court Hotel for this event which was held on 5th and 6th of April. We had been pleased with the venue last year and had received favourable feedback and this showed in a vastly increased entry. 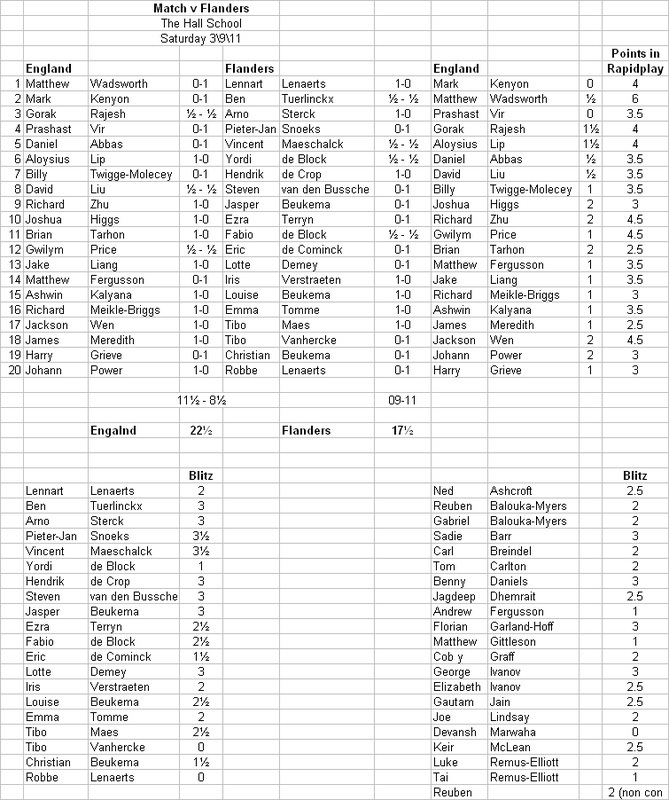 We had 152 players sitting down which was 36 up on last year and more than two years ago when the event was held in Kingston-Upon-Thames. Obviously we will try and get the same venue for 2015, watch this space! 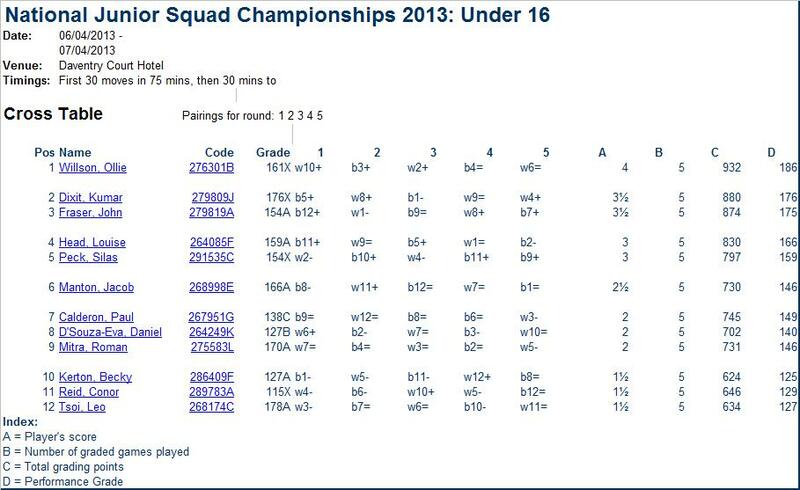 The U16s had 18 entries and on the top 8 boards only half went with the seeding. Even at this level grades are not the be all and end all! 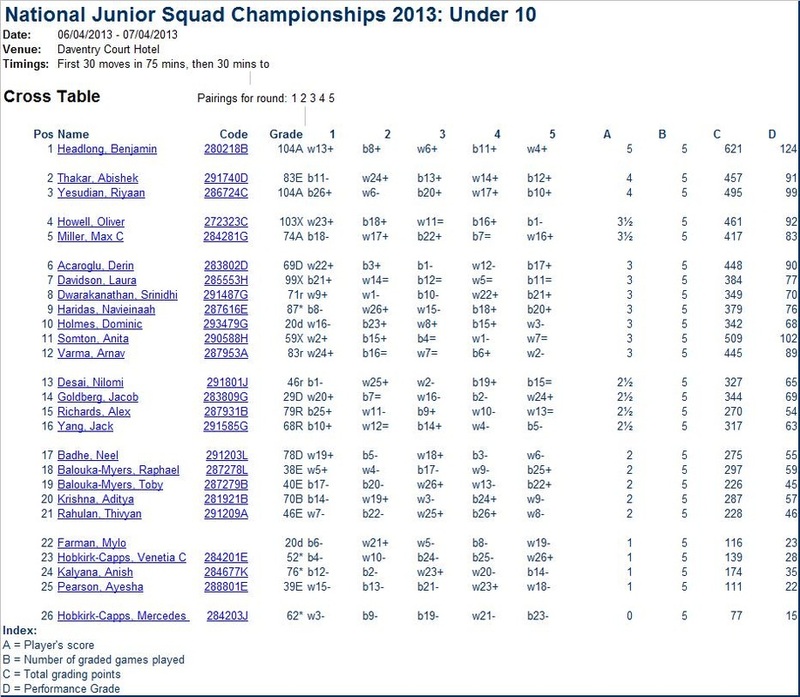 Only the U14s saw the number one seed win (although at U12 Jonah was only seed 2 on alphabetical order). 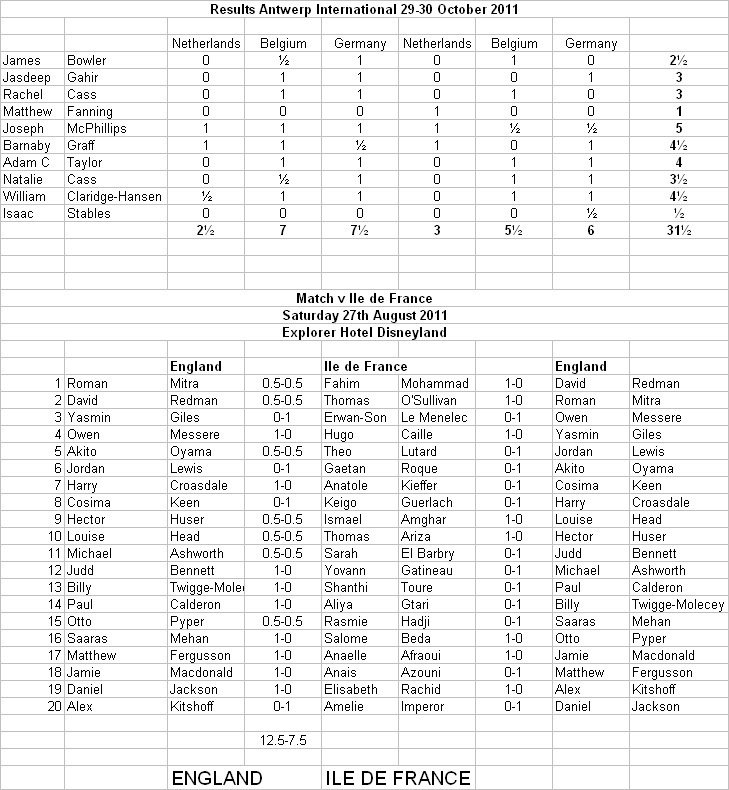 The U14s had 30 players, the U12s 73 and the U10s 31. After 3 rounds only J. Pein was on 3 points in the U16s, there were 6 on 2.5 in the U14s, in the U12s Dominic Klingher was playing Yaqub Saeed whilst Adithya Munshi also had 3 points and at U10 Adithya Paleri and Remy Rushbrooke were our only 100% players. In fact these two had a quick draw (do gms have a lot to answer for?) and were joined on 3.5 by Anita Somton, Susie Wang and Nicholas Vallis. The pairings for the final round were Remy v Anita; Susie v Adithya and Nicholas down floating. The U12s had two on 4 points with Adithya playing white against Dominic. 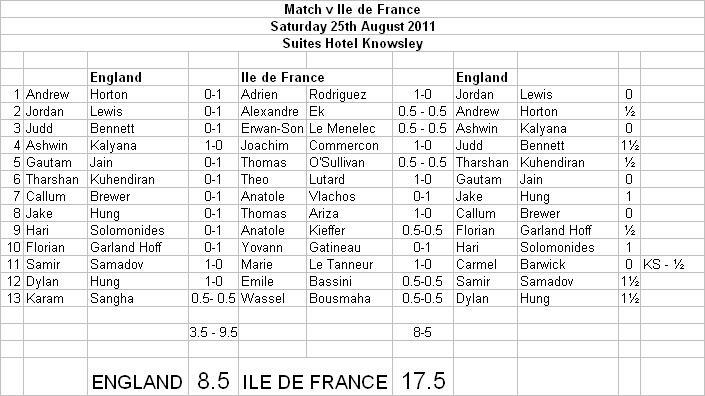 The U14s had only one player on 3.5 (it was a tough tournament) and Koby Kalavannan floated down to play Joshua Higgs who was one of 6 players on 3 points. Finally at U16 level Richard Zhu lowered the colours of Johnny Pein whilst Akito Oyama defeated Sam herring leaving Richard and Akito as joint leaders. As they had played in round three Akito floated down to play Adam C Taylor and Richard also floated down to meet Matthew Howell. Adam was now playing like a top seed and duly dispatched Akito however Richard well out graded Matthew and duly won to become U16 champion. At U14 level Koby Kalavannan was the leader on 3.5 and floated down to play Joshua Higgs. Also on three were Gwilym Price and Jackson Wen; James Golding and Gautam Jain whilst Jae Holton floated down. The top three boards were all drawn but Jake did win and so joined Koby on 3.5 to share the championship. Our two U12 leaders played and Dominic duly won to be the only one of the 152 entries to gain 100% and became U12 champion. At U10 there were 5 players on 3.5 and three drew. The only winner was Adithya Poleri and he became our U10 champion. Niall Ali and Francisco Bernardini continued where they left off at Swindon gaining their second norm with a round to spare whilst in the final round Reuben Balouka-Myers also gained his final norm and joined his brother in the squad. and we welcome them in to the squad. First norms were gained by Matthew Howell and Partha Mulay and we hope to see both of them in the squad soon. We would like to thank Puma Hotels for providing such an excellent venue and we will be returning in April 2015. Date to be announced by the end of the month. I would personally like to thanks Matthew Carr for bringing down the equipment and arbiting, Glynis Purland for arbiting and Ian and Hannah Burford for all the work they did setting up before, during and after the event. These were held in Swindon over the weekend 22/23 February and, as always. were very well organized and very successful. I was presenting the prizes with Loz Cooper so have been unable to get the winners down but will check the website asap and give a roll of honour, Squad winners were Peter Batchelor and Akito Oyama joint U18 winners with 4\5 whilst Daniel Gallagher and Gautam Jain were two of the four U14 winners also with 4 points and Koby Kalavannan won the U12s with 5.5. Alex Davies and Alex Sheerin gained their second norms and we welcome both of them in to the squad, Niall Ali, Francisco Bernardini and Devansh Marwaha all got first norms. We wish them well at the junior squad in April. Timings:First 30 moves in 75 mins, then 30 mins to completion. Note: The performance grades are for guidence only. They are based on the players' grades shown on the cross table. English (out of 6) I have used the full name for the "host" entrants as they are not above.